This doesn't mean that there are no physiological reactions from alcohol: reaction time, judgement, and inhibition are all impaired, which can cause you problems that may have serious consequences, or that there are not serious consequences to heavy, long term drinking (there are). 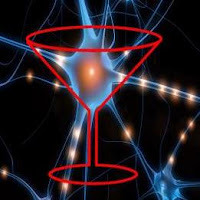 It does, however, mean that if you've been worrying about a cocktail or two killing your brain, you can stop worrying. That's good news. I was worried about all of those Cranberry Champagne Cocktails that I had on Valentine's Day.